Gill: You are cheating, I did not expect this. Kaushik: If you feel, sir, that I am cheating you, I am prepared to leave the camp. Gill: You cannot do that. I order you to send him back. I will give you his replacement. Kaushik: In such circumstances, I cannot work. You have no faith in me. uring the selection trials, forward Sanjeev Kumar's selection sparked a controversy. The medical tests conducted on him pointed out poor eyesight. There was nothing new in that. Sanjeev was wearing contact lenses since a long time. If wearing spectacles or contact lenses was a disqualification, the sports world would not have seen geniuses like Clive Lloyd, Zaheer Abbas or Martina Navratilova. Sanjeev was ideal in my scheme of play and critical for my strategy. I saw in him an inside-forward who was also a good charger and tackler, and who could defend well. After Dhanraj, he was the best rusher during penalty corner defences. His playing at left-in would have bottled up the right-in of the opposing team, especially of the strong Australian side, with whom was our first match in the Commonwealth Games. In the Murugappa Gold Cup tournament which served as the selection trials for the Commonwealth Games team, Sanjeev Kumar captained the Punjab and Sindh Bank team, and scored around a dozen goals. Physical parameters like sight should be evaluated along with the individual's technical excellence and skill. But such wisdom did not dawn on the decision makers in this case. Jyothi and Ashok were dead against drafting him in the side. Ashok had some genuine doubts about Sanjeev's physical fitness. I agreed with him and pointed out that so was the case with others in the camp like Mohammad Riaz and Ramandeep Singh. I assured him that I would improve his fitness level in the days to come, and explained the tactical reasons behind his selection. Even as we were discussing, Sanjeev scored a goal in a trial match. This took some pressure off me, and eventually Ashok was convinced. On the third and final day of the trials, Gill chaired the crucial Selection Committee session. Besides Gill, others present were Jyothi, Ashok, myself, Ganesh, C. R. Kumar and D. S. S. Murthy. The Sanjeev issue came up early. There were no takers for my view. Then C. R. Kumar took up the cudgels and backed my standpoint. At this, there was a sea change in others, and everything fell in line. A week after the team selection and announcement, I smelt a rat when Sanjeev Kumar was directed to undergo medical scrutiny again. Meanwhile, secretary Jyothikumaran contacted C. R. Kumar and asked him to name three alternates for Sanjeev. Seeing this sudden development, myself, assistant coach Ramesh and C. R. Kumar signed a letter emphasising Sanjeev's importance and faxed it to the IHF president in Delhi. Jyothi then fired Kumar for this 'defiance'. "You people want to start a trade union," Jyothi was believed to have said. He spoke for at least ten minutes with Kumar to say that the IHF chief was very angry with us. Kumar was a bit nervous at this stage. The next day, I got a message to contact Gill in Delhi. When I talked to him from Ganesh's house in Bangalore, Gill was roaring like a lion from across the other side. For the benefit of the readers, I will try to recollect our conversation verbatim. Gill: I direct you to send Sanjeev back. You give me three alternate names. Kaushik: Sir, he fits into my game plan very well. He scored two goals in today's match. You can also take the opinion of the other two coaches. Sir, Sanjeev is in my first eleven. Gill: No, no. I don't want to talk further on this topic. Sanjeev is a blind man. How can you put him in this game. Kaushik: He is not playing for the country for the first time. He has played many important tournaments. His eyesight is not a sudden problem. I discussed this with you during the trials. You also spoke to the doctors. Gill: You are cheating, I did not expect this from you. Kaushik: In such circumstances, I cannot work. You have no faith in me. I can just say that because of domestic problems, I could not carry on. Is that okay, sir? Gill: You send Sanjeev back. You carry on. This is my order. With this, Gill cut the line. I was red-faced and tense. I felt hurt. I cannot forget that night even now. It was undoubtedly the worst moment of my life. I don't know exactly what medical report D. S. S. Murthy faxed to Gill on Sanjeev Kumar. Murthy, a power broker in Indian hockey, seemed to have a vested interest in this issue. He was lobbying hard to put one of his state players, P. Shanmugham, in the Commonwealth team or in the 'A' team. I had spurned his selection for both teams since better players than Shanmugham were available. After I was forced out in December 1998, this same player was inducted into the team for the Indo-Pak series. Coach Bhaskaran did not play him for even one minute in the entire 9-match series. The irony in all of this was that Shanmugham too wears contact lenses! After the stormy conversation with Gill, I rang up my eldest brother, Shri P. R. Kaushik, who is one of the senior most IAS officers in the country. My brother calmly advised me thus, "You have taken the responsibility of coaching the Indian team. You must do your duty at any cost. Forget about dropping out, for if you do so, it will only spoil your name." His words of wisdom calmed me down to a great extent, as did Ganesh's advice. Ultimately, I had to inform Sanjeev Kumar of his exclusion. Perhaps he had a wind of it, since he was being repeatedly subjected to medical tests. Captain Dhanraj asked IHF secretary Jyothi to give him a flight ticket to return home, to which he agreed. I now had to find a replacement for Sanjeev. In the absence of Sandeep Somesh, Ravi Nayakar and Rajesh Chauhan, my only hope was Rahul Singh. Rahul, captain of the All India Central Excise and Customs team, was a trusted centre-half, equally at ease in propping up the frontline as well as falling back to defend. 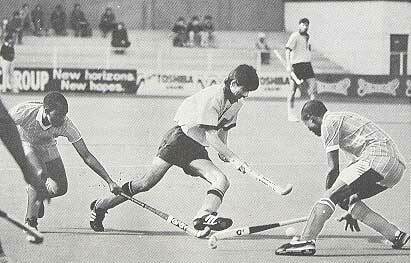 He was also the captain for the India 'A' team that C. R. Kumar took to Hamburg for the Panasonic Masters Cup. However, on Kumar's return from the Hamburg tournament, when he met Gill in Delhi, the IHF president prevailed upon Kumar to take Daljeet Singh Dhillon as Sanjeev Kumar's replacement. My requests to include Rahul were met with statements like 'He is also in the blind list', 'Don't hang on to him. No one will give him'. Rahul Singh, who was the captain of the team that Kumar took to Europe, became blind overnight when I wanted him! Later I fumed at Kumar for buckling under pressure and selecting a sub-standard choice. I made it clear that I will never select him as an assistant in the future since he was not firm in his convictions. No deserving player should be deprived of his chance due to the cowardice of the coaches. At this stage, M. P. Ganesh requested the IHF president in a confidential letter to nominate Olympian Ashok Kumar as the administrative or technical manager of the team. Instead, Gill chose M. S. Balakrishnan, secretary of the Indian Airlines Sports Board, and also a senior vice president of the IHF, as the manager of the Indian team.